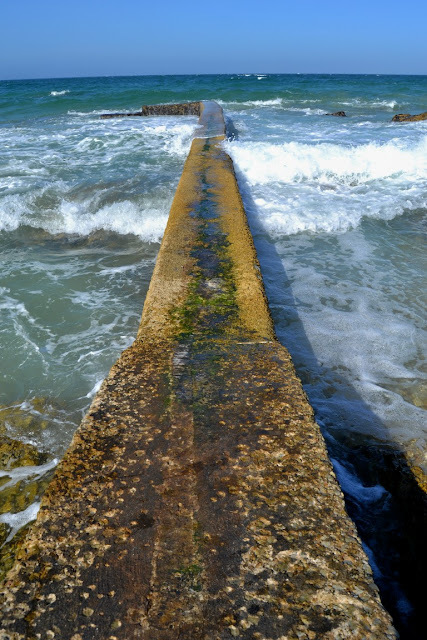 I've never really thought about the wall leading into the sea between Denville Beach and Humewood Beach till I was standing on it this afternoon. Why is it there? My guess was that it encloses a pipe and once I guessed that I wondered if it isn't the pipe that was used to pump water from the sea to the old dolphin pool at the Oceanarium. The exams are over and the Damselfly and I are confident that we will be passing grades 4 and 7 successfully again this year. Did it mean that there was time to finally get out there and take some photos again seeing that I've run out? Well, not really. 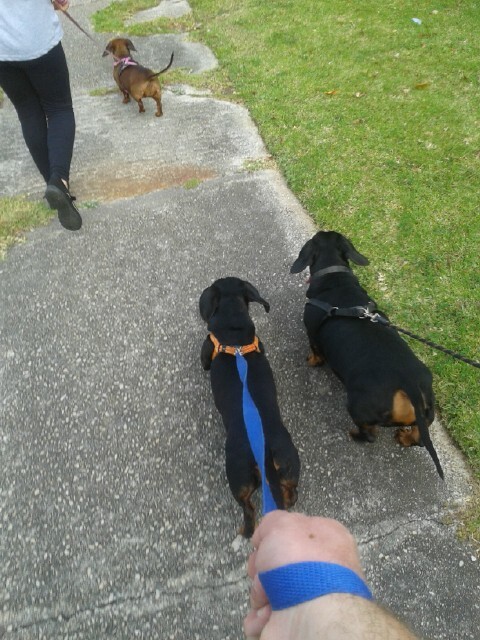 There was a little time this afternoon though to take the sausages for a walk around the block. Camera will have to start working overtime from tomorrow again. 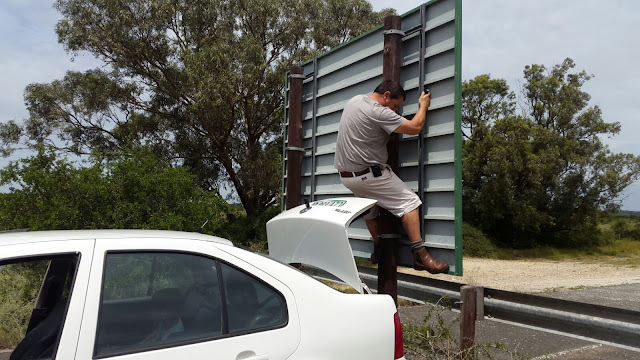 Seeing that I normally (try to) do a Geocaching related post on a Saturday, I really wanted to share this with you today even though it isn't in Port Elizabeth. A couple of Geocachers got together in Nieu-Bethesda for a caching event tonight and one of the Port Elizabeth cachers up there for the event decided to go and climb the Compass Berg today to find a cache located right at the top. 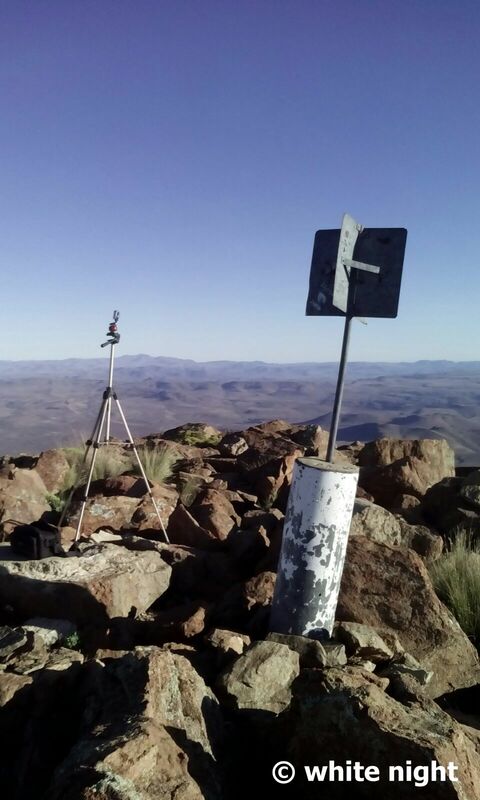 The Compass Berg is located north of Nieu-Bethesda and close to the boundary with the Northern Cape. 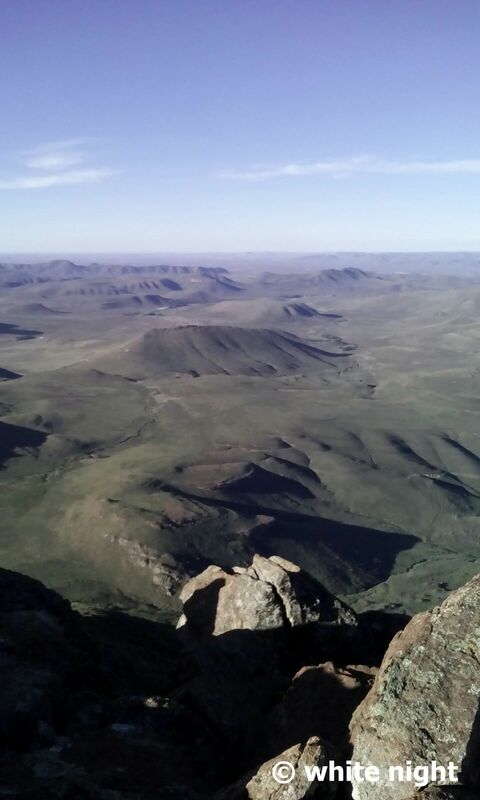 At 2 502 meters above sea level, the Compass Berg is the second highest mountain in the Eastern Cape and it takes about 4 hours to walk to the top from the closest parking area. Check out these pictures from the top shared on the Geocaching Whats App group this afternoon by Hilton "white night" after he got to the top. WOW! This week's Video Friday post is another of Duncan Noakes' time lapse videos. 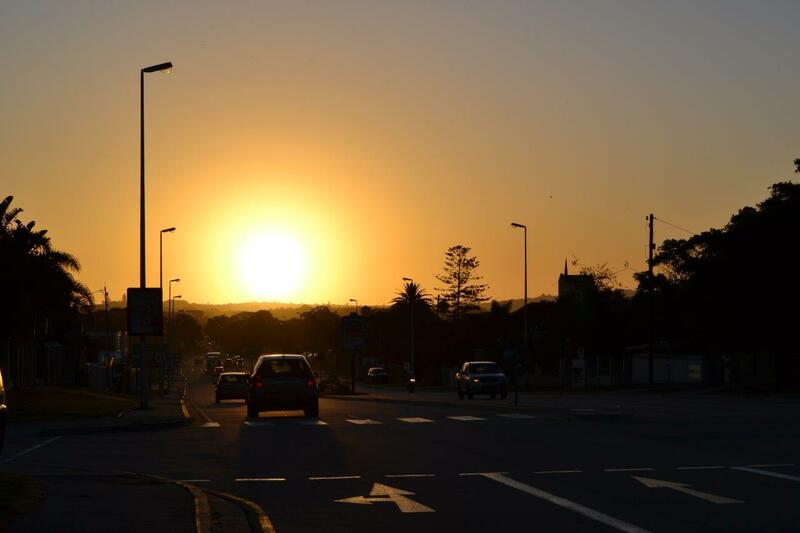 This time a stunning sunset time lapse over Maitland. 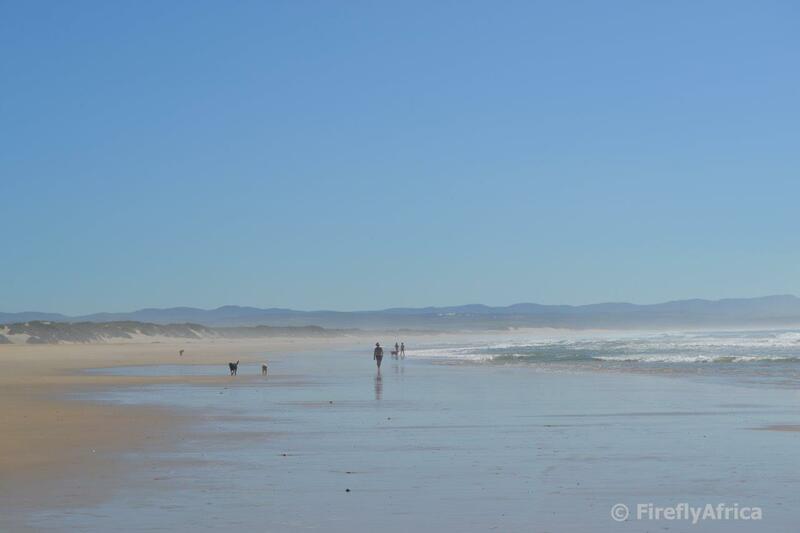 An early morning walk along the beach at Kabeljous. I know it's not PE but hey, close enough. If you had to start walking along the beach from Maitland you will pass Blue Horizon Bay, Van Stadens River Mouth, Gamtoos River Mouth and Kabeljous before getting to Jeffrey's Bay. 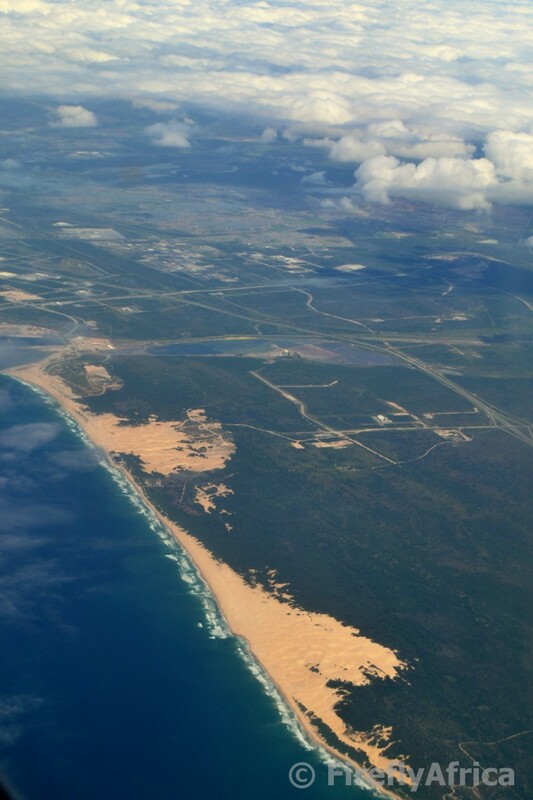 Miles and miles (literally) of sandy beach. I've always wanted to do it. Maybe... someday. A little detour via Beachview on the way back from Jbay today had me driving along the road from Maitland to Seaview for the first time in ages. Strange how often I used to get out there and how seldom I do these days. Just had to stop and get a picture of the road along the coast. Between this stretch and Marine Drive from Schoenies to the beachfront we sure have a few notably scenic coastal drives around the city. The Boardwalk Hotel, all lit up and looking like a fairytale castle, with Shark Rock Pier, all lit up, Hobie Beach, all lit up, and the beachfront, all lit up. Isn't the beachfront just beautiful at night? Last week I posted Duncan Noakes' Sunrise at Shark Rock Pier time lapse after discovering his breathtaking time lapse videos on YouTube. I decided to run through all of them in the regular Video Friday posts. This week's one shows the Nelson Mandela Bay Stadium in lights as the day turns to night. The view of Humewood as seen from Shark Rock Pier at dusk. Yet again, as I have said before, I am so glad we don't have an over-developed beachfront. Oh look, visitors arriving. Yesterday I posted a photo of Shark Rock Pier all lit up since it's revamp as seen from Hobie Beach. I thought I'll follow it up with a photo from the other side. I think I prefer this one of the two. Perhaps it's just the angle that is tighter or the fact that there are rocks on this side. Which ever, I like it. I have a question for you today and you can either give me your opinion as a comment here or on my Facebook page - FireflyAfrica. I've been going through bit of a slump lately. I'm just not taking as many photos around Port Elizabeth as I used to. Partly it is because life, work, life, family, life, KidZ' exams, etc (have I mentioned life?) is keeping me busy and I'm not getting out there nearly as often as I used to. Heck, I barely have time to go Geocaching and if that is the case you know I have a problem. My question I. What do you want to see on PE Daily Photo? PE in general? Then and Now? Historical sites like monuments? Natural stuff like trails, nature reserves and parks? People? Or just continue doing what I do (which is probably what you'll get till I get more time to get out there again) and bring you the images of the places I go to and get to see. Even if it means an overload of for example pier pictures if I've been to it. Anyhow, I thank you for your continued support for PE Daily Photo and a special thanks to those who does give feedback, comments and shares on the various platforms. The lights under the newly revamped Shark Rock Pier really lights up the water making for great photography. That along with the spotlight on the beach could even lead to extended bathing on those hot barmy summer evenings. Looking at Shark Rock Pier from the Boardwalk Hotel gives you a slightly different angle from the norm. If you look at photos of the pier it's normally from either side, from on the pier itself or occasionally from the sea side. Not often that you get a bit of a elevated view like this one I got from the hotel. 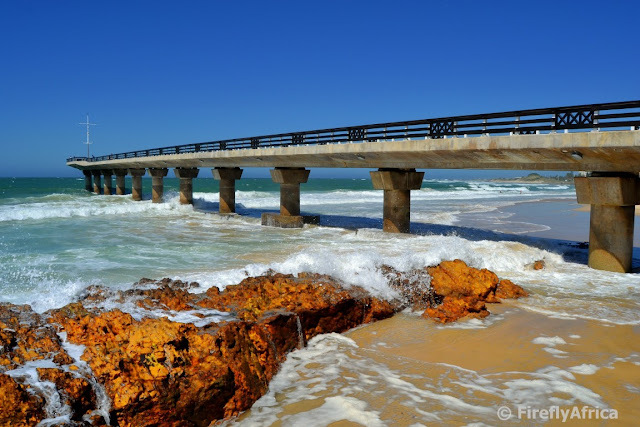 The Colchester area east of Port Elizabeth was a very busy spot in the mid 1800 and early 1900s, as it had the only pont over the Sundays River on the main road between Port Elizabeth and Grahamstown. The original pont was washed away in 1874 and a second one in 1875. 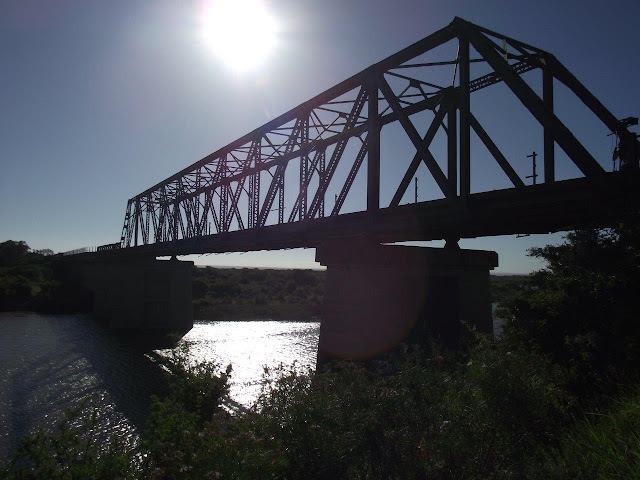 A bridge was commissioned in 1884 and opened on 5th March 1895. It was called the Mackay Bidge, in honour of John Mackay who's efforts resulted in its construction. This bridge was constructed entirely of steel and iron brought all the way from Sheffield in England. Due to the elements taking its toll on it, the road across the bridge was closed to traffic a couple of years ago although it can still be accessed on foot. I just love it when I find stunning videos portraying this beautiful city of our's. I discovered an exceptional one this morning showing a time lapse sunrise at Hobie Beach with Shark Rock Pier (still being revamped at the time as you can see) in it. Well done on a stunner Duncan Noakes. I'm definitely going to be sharing more of your videos in the weeks to come. 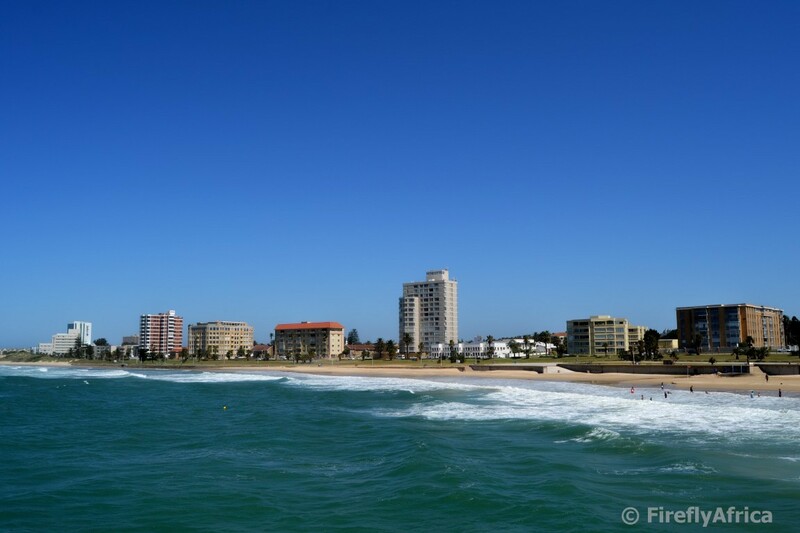 I have to admit, I haven't got a Port Elizabeth photo for you today. It's a combination of things, mostly bad luck coupled with being fairly busy at the moment. My external hard drive crashed a little while ago and with it went all my family and travel photos. It's going to cost me around R8k to have the contents retrieved in a specialist environment. Money I definitely haven't got at the moment. Last week my home laptop's motherboard decided it was time to pack a case and leave me. Probably looking at close the same amount to replace it with something proper. In the meantime I've gone through the pictures I had uploaded already and I just haven't had time to head out and take a few fresh pictures to post. Frankly, I don't have the energy and when I do get the time I just don't get there. I'm in serious need of a proper holiday. Not just a weekend away. A proper holiday. Something we haven't had for three years now as our last two December holidays got cancelled for various reasons out our hands. In the mean time, here is an after sunset pic to end the day off with. 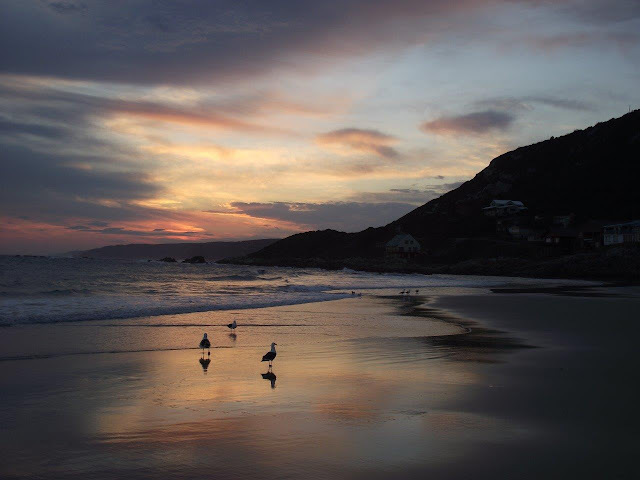 Not a PE sunset but one I photographed at Eersterivier in the Tsitsikamma. Close enough. The Port Elizabeth harbour was built in 1933 after the completion of the Charl Malan Quay (No.1 Quay, now used as the Container and Car Terminals). 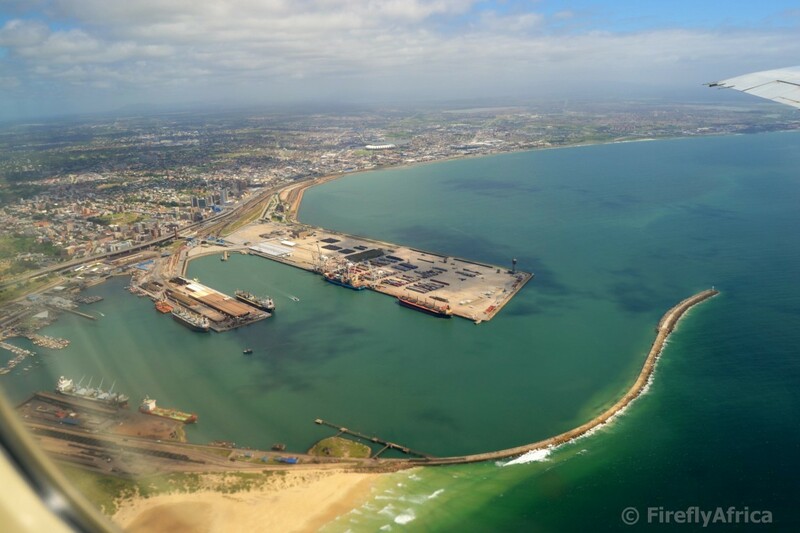 It is one of two harbours in Algoa Bay with the Coega Industrial Harbour being the other. The harbour wall can be seen on the right. Going along the wall to the left is the tanker berth where the ships carrying fuel to the harbour docks and to the left of that (where the two ships are) is the manganese ore terminal. Just above that on the left hand side is the yacht basin and the fishing boat section of the harbour with the middle section is taken up partly by the fresh produce terminal and gets used for the export of deciduous and citrus fruit. The far side of the harbour is the car and container terminal. The revamped Shark Rock Pier seen from underneath. Just thought I'll do something different. How about visiting the Kouga Dam? When was the last time you've been in the Gamtoos Valley? Perhaps I should ask, have you ever been for a drive up to the Kouga Dam? If the answer to both of these questions are "never" or "not recently" then there is no time like the present. 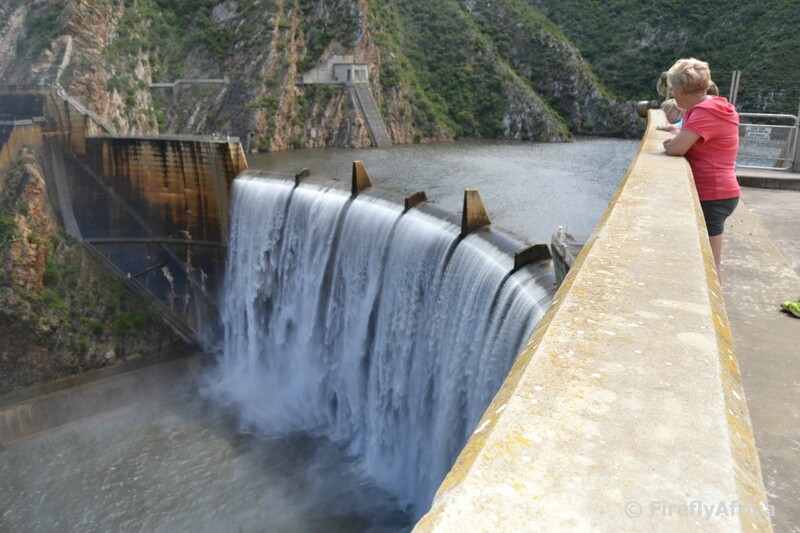 After all the rain we have had recently the Kouga Dam is currently overflowing and well worth a visit. The Kouga Dam is located about 21 kilometers west of Patensie and was opened in 1969. 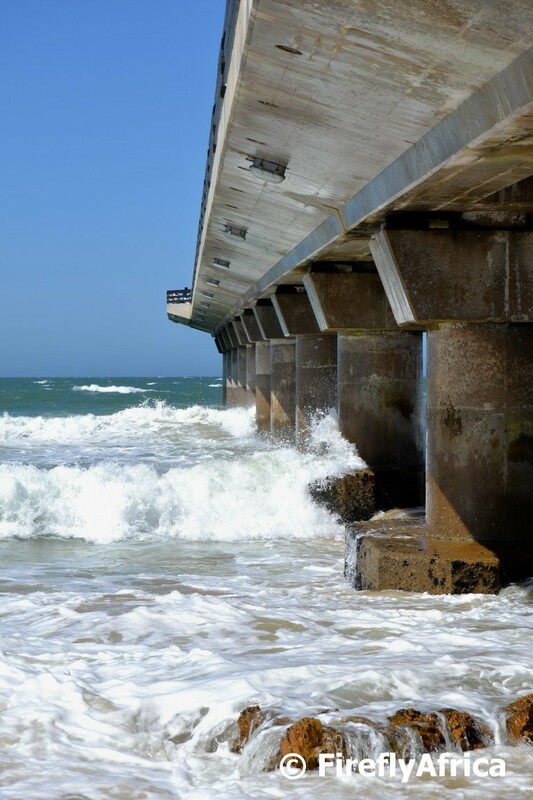 It supplies water to both Port Elizabeth and the farming area within the Gamtoos Valley and has a dam wall of 94,5 meters high and 202 meters long. Just thought you'll want to know. Every time I visit Durban and see how over developed their beachfront it is, I think of our own. We truly are very fortunate in Port Elizabeth that our beachfront wasn't developed like the one in Durbs. That we can drive normally along our beachfront and not struggle along narrow roads through tons of traffic. The we don't struggle for parking. That we can see the ocean from most of it without having a lot of buildings on the seas side of the road. 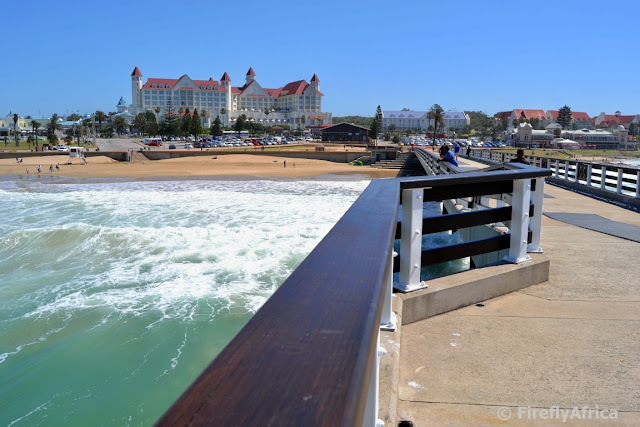 Don't you just love the Port Elizabeth beachfront? I sure do. The guys over at Chasing the Rainbow has been exploring around Port Elizabeth using the Nelson Mandela Bay Pass. One of the experiences they went to do was to cruise on the Sundays River Ferry and go sand sledding on the dunes at Colchester. Looking for a video to post for today I found this vid they posted on their blog (and YouTube). So here they are, chasing the rainbow in the sand. Everybody probably knows the well known line from Game of Thrones. "Winter is coming..." Well, going by the weather out there today it is clear that SUMMER IS COMING! Driving along the N2 from Port Elizabeth to Colchester you pass the Coega harbor and then it's a straight stretch to the Sundays River with not much to see on either side. Have you ever driven that road and wondered what the coastline between the harbor and Sundays look like? I didn't get to see it up close but I did fly over it (and man was my arms tired - yes, old joke, I know) just after takeoff on our way to Jhb. It would be nice to walk this piece of coastline, just to see it up close, don't you think? I've been watching people flock to Shark Rock Pier for a walk on it since it reopened last week after a lengthy refurbishment spell. Do they go and walk on it to see the new wood and cleanly painted railings? Probably. 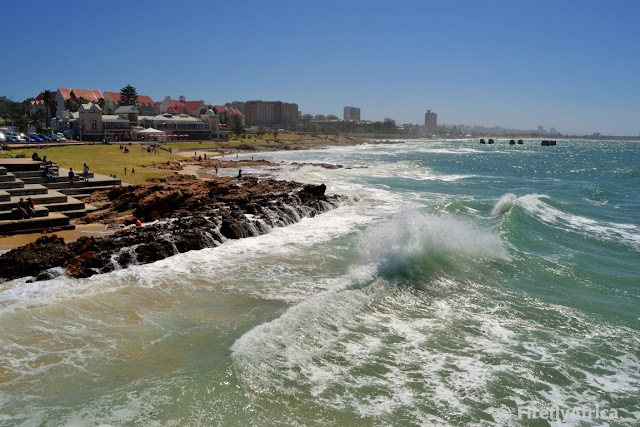 But they also go and walk on it because of the fact that it is one of Port Elizabeth's iconic attractions and has beautiful views of the surrounding coastline. Last week the Damselfly and I got to fly to Johannesburg for the annual Lilizela Awards of which I was one of the judges. Even though I get to road trip quite often working for ECTOUR, I don't fly nearly as much as I did in my previous job. When I do and I fly alone, I like an aisle seat but the Damselfly wanted to sit by the window and it gave me the opportunity to snap a few pics during take off while leaning over her. This is looking north while heading out towards Algoa Bay. 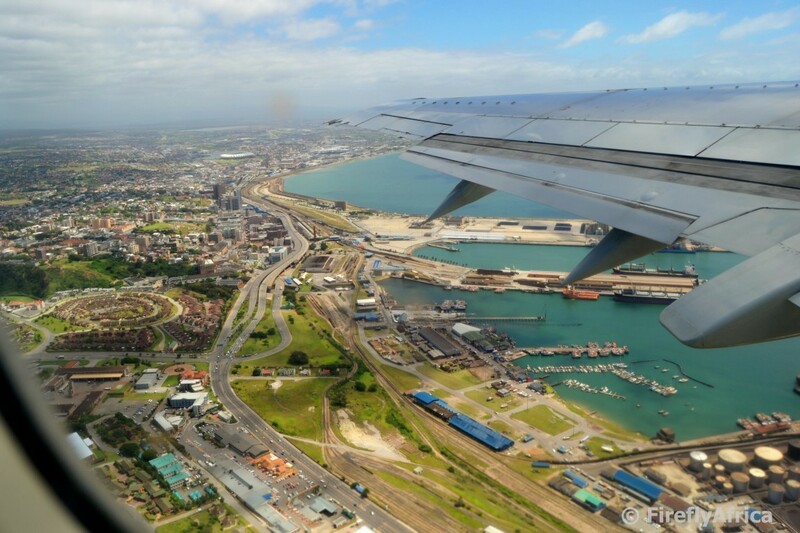 South End is in the forefront with the city centre and North End beyond on the left and the Port Elizabeth Harbour on the right.